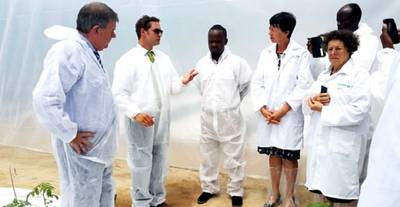 Greenport Holland in partnership with Bosman Van Zaal organised a visit to SMART project with the aim to inform farmers of Srop International on advanced skills and technologies in farming using Greenhouses. The workshop took place in Rwanda in a district called Rulindo located in the northern province at Mr. Jean Claude Ruzibiza farm called Rwanda Best. The workshop was also attended by Vice mayor in charge of economic development Mr. Mulindwa Prosper. Norbert van der Straaten, project leader SMART project, tought Srop farmers about the importance of improved seeds, integrated pest management, hygiene, fertilization, water management, smart greenhouses and training to achieve the next level in protected horticulture. The team from Uganda was led by Ssegirinya Sam the Executive Director of Srop International. Norbert van der Straaten and Srop International will develop in 2016 the introduction of SMART horticulture in Uganda. Visit the Srop (Save the Rural Out of Poverty) website for more information. Top officials of the Ministry of Agriculture and Animal Resources (MINAGRI) and Dutch officials have reaffirmed their commitments to strengthen the cooperation between Rwanda and The Netherlands in boosting horticulture and agriculture sector in general. The officials reiterated the commitments on November 24, 2015 while officially opening a Greenhouse for horticulture farming in Rulindo District, Northern Province. The greenhouse worth Frw 40 million, belonging to a local company dubbed Rwanda Best Ltd, is a pilot phase of the Smart Adaptive Sustainable Horticulture (SMART Horticulture). SMART is a public private partnership between Dutch leading horticulture companies and knowledge institutions. In this program, the partners aim to make horticulture technologies affordable and adaptable for farmers in Africa. The project opened in Rulindo is a pilot phase; and it’s the first of its kind in Rwanda with improved technologies for inputs including seeds, soil pest control, irrigation, and computerized watermanagement and fertilization. Also the greenhouse is the first of its kind in Rwanda and adapted to the Rwandan growing conditions. Speaking during the event, the Dutch Ambassador to Rwanda Frederique Maria de Man said that the new production methods and training center will not only serve Rwanda Best Ltd but also the wider horticulture sector. “So the future looks promising and bright and this whole program is very exciting and can play an important role in stimulating further developments in the horticulture sector,” pointed out the Dutch Ambassador to Rwanda. Tony Nsanganira, the State Minister for Agriculture, lauded the flourishing partnership with The Netherlands as it’s about supporting the private sector which will drive Rwanda’s economy. “We do believe in the private sector and we want it to drive the whole process,” said the State Minister, pledging the government’s full support to these initiatives. The State Minister added that horticulture has great importance to Rwanda not only in increasing exports, but also in reducing malnutrition. The event was also attended by Dutch businesspersons representing 18 companies including 13 interested in horticulture and 5 in livestock. Some of the Dutch firms include; Koppert, Rijk Zwaan, Bosman Van Zaal, DLV Plant, Orinso, Hoogendoorn, Wageningen University, Bopinc and Greenport Holland. The mission of the Dutch delegation that is in Rwanda since November 22, 2015 is meant to facilitate interaction between Rwanda and The Netherlands in order to promote trade relations and learn from each other. “We believe that it will turn into investment in Rwanda agriculture sector,” said one of the delegation members. TAHMO aims to set up 500 to 600 weather stations in Africa to set up a weather network. vds a’Campo is the partner of TAHMO in Rwanda. At this moment there are 27 stations operating in Africa. Read the news article about this project in Business Daily here. Greenhouse constructor Bosman Van Zaal and horticultural automation supplier Hoogendoorn facilitate farmers in protected horticulture in East Africa. Several projects have already been developed in Ethiopia, Kenya, Uganda and Tanzania. With Mr. Norbert van der Straaten (vds a’Campo) as local representative based in Kigali, Rwanda and two local Bosman Van Zaal offices in Ethiopia and Kenya, new opportunities lie ahead. The Dutch provide together with partners turnkey solutions with knowledge and expertise on greenhouse building, cultivation systems, climate control, energy optimization, efficient use of water and fertilizers, plant physiology and pest control. Read the full article here. Tijdens het bezoek van Minister Ploumen, is de samenwerking op tuinbouw tussen Nederland en Zuid-Afrika opnieuw bekrachtigd. Door ondertekening van het contract tussen het Nederlandse SMASH-consortium en Jomajoco, een sla-teler in Gauteng, wordt er een start gemaakt met het derde pilotproject waarin Zuid-Afrikaanse en Nederlandse experts gezamenlijk oplossingen ontwikkelen voor de Zuid-Afrikaanse markt. Lees hier het hele nieuwsbericht van GroenteNet. The project (also referred to as SMASH – Smart Adaptive Sustainable Horticulture) in Rwanda was launched on 12 November. The aim of this project is to enable farmers in Rwanda to develop a sustainable and profitable business where productivity and food-safety are the key. SMART also has projects in South-Africa. Read the full article of the Horti Daily website here. Nyenrode Business University will host a sector meeting on June 24th dedicated to informing the Dutch business community on the current economic and political developments in Bangladesh. The sector meeting will further serve as a preparation for the Trade Mission Agro-business & Water which will take place in September 2013, led by Nyenrode in cooperation with the Embassy in Dhaka. Read the invitation here or read the full report preformed by Nyenrode and vds a’Campo, Exploring the development of food supply chains in Bangladesh. Het artikel met bovenstaande titel is geplaatst op de site van AGF. vds a’Campo heeft in samenwerking met Nyenrode onderzoek gedaan naar de retailsector in de Maghreb regio. Het nieuwsbericht is hier te lezen, of lees het volledige rapport, De ontwikkeling van retail en voedingsverwerkende industrie in de Maghreb. vds a’Campo zal samen met Nyenrode meewerken aan het uitvoeren van de verschillende sectoronderzoeken in Bangladesh. Dit project wordt geleid door prof. dr. Desiree van Gorp. Ook Naomi Smeele is namens Nyenrode bij dit project betrokken. Eind 2012 kwam de introductie van dit project als volgt in het nieuws.